1# Folk Remedy To relieve muscle pain after a strenuous workout, drink a mixture of water and baking soda. Remove grime and fungus from your nails by scrubbing them with an old toothbrush with some baking soda on it. In a basin mix 3 tablespoons baking soda, 1 tablespoon peppermint essential oil, 1 tablespoon salt and warm water. Soak your hands and feet for 20 minutes. This method will ease itching, soreness and odor. To freshen up your breath, mix some baking soda with water and gargle. To whiten your teeth, put some baking soda on your toothbrush and brush your teeth. This is the most effective home remedy for tooth-whitening. Mix a tablespoon of baking soda and a teaspoon water to make a gentle face exfoliator. This treatment will effectively remove excess facial oil and dead skin cells from your face. 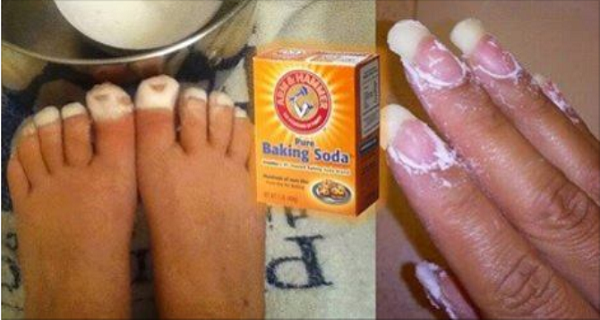 Apply some baking soda on bee stings, insect bites, itching from poison ivy, oak, etc. to relieve the pain and itching. Speed up the healing of canker sores and herpes by applying a mixture of baking soda and water directly on the affected place.